Signing up with StrongVPN is fairly straightforward, however quite a lot of personal information is required, even if users wish to pay with Bitcoin. The service is available for a range of operating systems including Mac, Windows, Android, iOS and Linux, with detailed instructions provided on the company website. The company does not provide trial accounts however it does offer a seven day money back guarantee for users that are unhappy with the service. 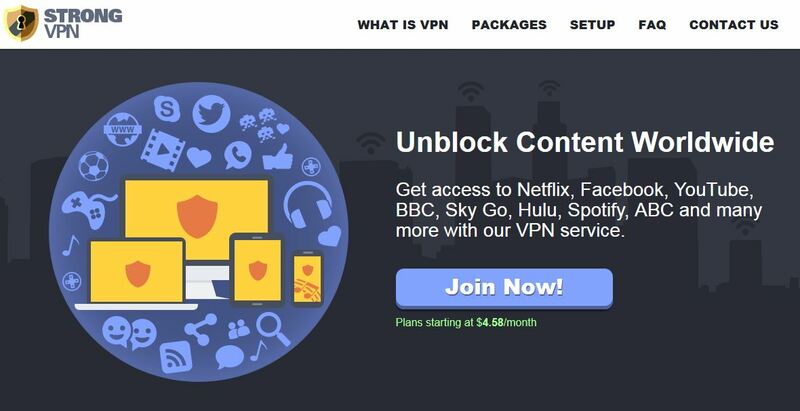 StrongVPN provides customers with unlimited bandwidth and abilities to switch VPN locations when logged into the service. Users residing in countries that censor certain websites or frequent travellers will appreciate the freedoms they achieve with services such as this which give the ability to log in from servers based in North America or Europe. There are a variety of good reasons to register for virtual private networking services, these include assuring the security and anonymity of your use of the internet, using worldwide IP addresses to access sites and services that may be unavailable or blocked from countries of residence and guaranteed safety from eavesdroppers when using insecure internet connections, like WiFi hotspots. Business users and mobile device users are particularly at risk of cyber crime so using VPN services does eliminate security hazards posed by the transmission of sensitive data from insecure devices.